But this was before the Internet, before 3G, before Google, before most people had mobile phones. The world was not ready in 1995 to hold the world in its hands. 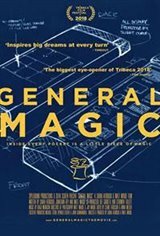 Fierce competition, incredible hubris and heartbreaking betrayal dominated behind the scenes of General Magic. While some never recovered from the failure that accompanied its downfall and bankruptcy, others went on to soar. The lessons learnt at General Magic were instrumental in the creation of the iPod, iPhone, Android, eBay, even in the corridors of President Obama's White House. And although General Magic died, those concepts and the people who pioneered them went on to change how the world connects today.